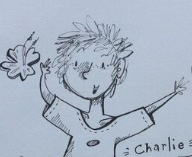 Help Charlie find the treasure on each of his adventures. Keep track of Charlie’s travels on your very own Charlie’s Adventures map! Each book comes with its own sticker to put on your map.